» Isaan Dialect - Introduction to the dialect spoken by approximately 1/3 of Thailand's people. » Thai Particles - Explanation of Thai language particles with example sentences. » Loi Gratong Festival - Thailand's magical floating basket festival. » Same Same - Why do Thais say same same instead of just same? » Space Invaders - Play Space Invaders game online in your browser using Flash plugin - SANUK MAHK! » Thai Videos - Traditional Thai dancing videos. » Thai News Stories - English translations of news stories from the Thai press. » Visitors' Guestbook - Leave a comment. This page has the aim of teaching the visitor to Thailand a few Isaan phrases, together with a little grammar thrown in as well for good measure. Isaan is the name given to the North-Eastern region of Thailand, covering 170,218 square kilometers, approximately one third of Thailand’s land area. In 1997, Isaan's population was 21,086,501 million people, about 35% of Thailand's total population. All Thais learn standard Thai (Central Thai) in school. It's the language also used in the newspapers and on TV/radio and is essentially the lingua franca of Thailand. But at home Isaan people (KON ISAAN in Thai) will speak a version of Lao called Isaan dialect or North-Eastern Thai. You may well wonder why someone visiting Thailand should bother going to the trouble to learn some Isaan dialect. Surely learning Thai is quite enough without having to learn an extra language. And another tonal one at that. Well, as a visitor to Thailand, it is very likely that you will spend a considerable amount of time with people from Isaan. They make up roughly 1/3 of Thailand's population and are very often employed in jobs that bring them into close contact with tourists. Especially so in two of Thailand's major tourist destinations, Bangkok and Pattaya. Whether it be hotel staff, restaurant workers, taxi drivers or street vendors, you're sure to come into contact with KON ISAAN. You may even be lucky enough to have an Issan lady as your girlfriend or wife. In addition, as a part of your stay in Thailand, you may also consider visiting Isaan for a welcome break from the hustle and bustle of Bangkok. Compared to other parts of Thailand the pace is much slower, and the prices are also considerably cheaper. The Isaan people are in general an extremely friendly and good-natured people, and they respond very favourably to those who make the effort to appreciate their culture and learn their language. Just a few words of their language spoken to them by a tourist will immediately set you apart, since foreigners who speak any Isaan dialect at all are extremely rare indeed. The Isaan people are of Laotian descent and until the 1960s, they were still called Lao. In fact, the Isaan region and Laos had originally been a part of the Lao Kingdom of Lan Xang (founded in 1354). Following the fall of Ayutthaya in 1767 the Siamese kingdom held sway in Laos and Isaan, and carried out forced population transfers from Laos to Isaan in the 18th and 19th centuries. (This is one reason why today Isaan is so heavily populated compared to Laos: 21 million in Isaan compared to 6.5 million in Laos). In the 19th century French colonialists made incursions into Laos and were too strong for Siam (1). 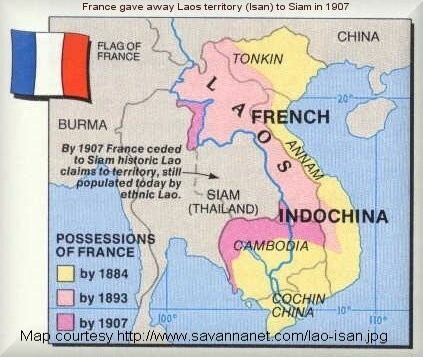 Franco-Siamese treaties of 1893 and 1904 ceded Lao territory to France leaving Isaan as Siam’s north-east frontier with French Indochina. Even today, you'll sometimes see Lao posters on internet message boards talking about returning Isaan to Laos, but the Isaan posters make it clear they are Thai now and are happy the way things are. Isaan dialect (also called North-Eastern Thai) is really nothing but Lao. It is virtually 100% Lao in vocabulary and intonation; in fact there are more Lao speakers living in Thailand than in Laos. As has been mentioned earlier, all Thais learn Central Thai in school and its the language used in books, newspapers and on the TV/radio. However at home, North-Easterners will speak Isaan. Even outside of Isaan, in Bangkok for example, when you are with a group of North-Easterners, they will invariably at some point drop their Thai and lapse into speaking Isaan with one another. Forty or so years ago (in the 1960s) the Thai government took away all forms of their writing in an attempt to assimilate them into Central Thai culture. However, they continued to maintain their Lao dialect through speech, and it continues strong to this day, as do their distinctive customs and traditions. The biggest difference between Lao and Isaan is that Isaan uses the standard Thai alphabet, not the slightly different Lao alphabet. The Lao alphabet is very close to the Thai alphabet (and derived from it), but it's different enough to present a fair degree of difficulty to Thai and Isaan folks when trying to read Lao material. Some Isaan folks I've asked say they can read no Lao because the alphabet's too different, others say that if given eg a Lao newspaper article, they can maybe read and understand a percentage (at most 60%) of the material with some difficulty. Lao (and Isaan dialect) tones are also often different than Thai. The words may well be virtually the same, but the tones aren't. Something around 80% of the Thai-Lao vocabulary is identical, though the tones may confuse you. However Isaan dialect and Thai are close enough that, for native speakers, the two are mutually intelligible. They are perhaps as close as Dutch and German (maybe even a little closer). The negative in Isaan is BAW eg MAI ROO in Thai (don't know) becomes BAW HOO. Listen out for that BAW and you will be able to figure out a lot of their speech. Even though the Lao alphabet has what clearly looks like a Thai 'R', Isaan (and Lao) has no 'R' sound. Two thirds of the time it's pronounced as an 'L' and the other one third as an 'H'. eg ROT (car) in Thai becomes LOT in Isaan and NAK RIAN (student) becomes NAK HIAN. Isaan has no CH sound as in Thai - the CH becomes an S sound eg CHOK DEE (good luck) in Thai becomes SOK DEE in Isaan; CHAHT THAI (Thai nationality) becomes SAHT THAI. Consonant clusters are often simplified eg PLA in Thai (fish) becomes PA in Isaan. Finally, it should be noted that within N.E. Thailand there are in fact several different dialects of Isaan. e.g. Korat has its own dialect which is understood with difficulty by people outside of the area. Accordingly, I have just included a few basic Isaan phrases with a little grammar thrown in for good measure. I have found these phrases to be generally understood by the majority of North-Easterners I have had contact with. I hope you will find some of them useful in your travels to Thailand. equivalent to MAI in Thai. Can you speak Lao (Isaan)? In Isaan they don't PHOOT LAO as in Thai but WAO วาว or PAHK ปาก LAO. You can reply WAO LAO DAI NIT NOI - I can speak a little Lao. Where will you go, where are you going? (Sometimes JAHK จาก, same as Thai). - I come from Mexico. Is that right, is that correct? If someone asks you to dinner, assure them the food is SAEP LAI LAI or SAEP IH-LEE. In Thai, KHAWP JAI is only used to children/inferiors/intimates. SEE-DA สีดา, BAK-SEE-DA and MAHK-SEE-DA are Isaan for the Guava fruit. MUAN LAI - a lot of fun (in Thai: SANOOK MAHK). (In speech, usually just shortened to KHIT HAWT JAO). Fermented fish; a delicacy in Isaan. DER is a polite particle tacked onto the end of a sentence, roughly equivalent to NA KHRAP นะครับ or NA KHA นะคะ. DAWK is a particle tacked on to the end of sentences. It adds politeness and makes things sound softer and more friendly. The equivalent in Central Thai is RAWK. - That's all right/It doesn't matter/Don't mention it. eg KHOI YAHN ข่อยย่าน - I'm frightened. eg YAHNG JON GUHP KHAHT BUHT LAEW หย่างจนเกิบขาดเบิดแล่ว - I walked until my shoes were worn out. eg PAI BUHNG MAW-LAM NAM AI BAW MEU NEE - ไปเบิ่งหมอลำนำอ้ายบอมื่อนี่ - Would you like to go to a MAW-LAM concert with me? eg PAI DOO MAW-LAM GAP PHEE MAI WAN NEE ไปดูหมอลำกับพี่ไหมวันนี้- Would you like to go to a MAW-LAM concert with me? 1) Up until 1939, Thailand was known as Siam. 2) Farang is the Thai word for a white Western foreigner. Thanks are due to KHUN MAI หมาย (from Sisaket), GAY เก๋ (Roi Et) and DAENG แดง (Buriram) for their help in recording the sound files. More words and sound files will be added to the table as time and circumstance permit. Please send any comments and corrections here. This site is © Copyright Boo Boo 2003-2016. All Rights Reserved.